Discussion in 'The Refreshment Lounge' started by Blake Bowden, Jun 22, 2009. The almost transparent veil measures about 6.5 x 9.5 inches and bears dark red features of a bearded man with long hair and open eyes. The legend holds that Jesus rewarded Veronicaâ€™s charity in wiping the sweat from his brow by imprinting his image into the cloth. The image on the Monoppello cloth becomes invisible depending on the angle from which the cloth is viewed. Ultraviolet examinations of the cloth, carried out by Prof. Donato Vittore of the University of Bari, confirm that the image is not paint. Particularly noteworthy are several small flecks of reddish brown â€” presumably drops of blood from the wounds caused by the crown of thorns. 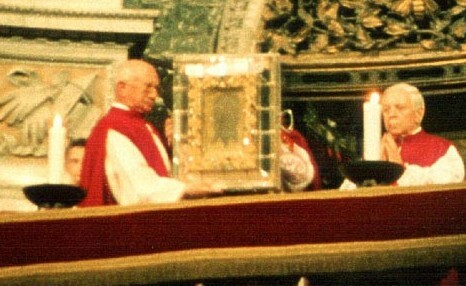 Enlarged digital photographs of the veil reveal that the image is identical on both sides of the cloth â€” a feat impossible to achieve by ancient techniques. These photographs have also been used to compare the veil with the face on the Shroud of Turin, which millions of Christians believe to be Jesusâ€™ burial sheet. Striking similarities were apparent: the faces are the same shape, both have shoulder-length hair with a tuft on the forehead, and the beards match. History records the existence of this relic from the fourth century, but only from the Middle Ages was it strongly linked to the Passion of Christ. From the 12th century until 1608, it was kept in the Vatican Basilica as a popular goal of pilgrims, mentioned in Canto XXXI of Danteâ€™s â€œParadise.â€ When the part of the Basilica containing the relic was scheduled to be torn down for remodeling, the relic disappeared overnight. According to records in the monastery, the wife of a soldier sold the veil to a nobleman of Monoppello in 1608 to get her husband out of jail. The nobleman, it turn, donated it to the Capuchins. In 1618, it was placed in a walnut frame adorned in silver and gold between two sheets of glass. It remained in the monastery every since. Fr. Pfeiffer invested 13 years of searching through archives to prove that this is the same cloth that disappeared in 1608.